Great news! My second full-length poetry collection, Dispelling The Indigo Dream, has been published by Local Gems Poetry Press, and can be purchased on their website at www.localgemspoetrypress.com . Just go to the website Bookstore, and click on Single Author Collections, and click on my book, or you can go directly to amazon.com and find it there, or just run the title through your favorite search engine. Please, everyone, buy a copy of the book to help support my publishers! I'm also excited to report that my chapbook, What It Means To Be A Man, has been accepted by Finishing Line Press for release later this year. In the meantime, of my poems, In The Off Season was published in East Coast Literary Review, The Myth was accepted for the next issue of Clarion, the literary magazine of Boston University Literary Society, and Sunset On False River has been accepted for the Long River Run anthology of Connecticut Poetry Society. Also, here is the link to the video of my reading last year at Cafe Mosaic in Eunice, Louisiana, courtesy of The Louisiana Review: http://www.youtube.com/watch?v=mMeEzHxbAS4. I forgot my jacket again. growing in fresh cow patties. to stay off the chain-link grasses. Well, this is my first blog entry since February, but that is not to say that I have not been involved in poetry; quite the contrary, in fact. The most recent and exciting news is that my second full-length volume of poems, Dispelling The Indigo Dream, will be released shortly by Local Gems Poetry Press of Long Island, New York. The release will be followed by readings and appearances in the Gulf South region this fall and in the New York City area in general and Long Island in particular. I will post a link for the purchase of my new book as soon as possible, and your support would be greatly appreciated. Next, I have had a number of poems accepted and/or published since my last post. My poem Dummy appeared this summer in The Minetta Review, the undergraduate literary journal of New York University. My poem In Quietude, which appeared in an earlier post, was published this summer in Lilly Press/River Poets Journal's Tales From the Matriarchal Zone anthology. My poem The Woods Grow Silent will appear soon in Snake Nation Press' Gulf Stream Poems anthology, and my poems Triple Negative and Nightmare appeared recently in The Ampersand Review. I also published a paper in this year's edition of Cantos, the literary review of Missouri Baptist University. The paper was titled "So You Want To Be A Poet?" and was a primer for beginning and developing poets on how to write, submit, and publish poems. I was also invited in March by Dr. Michael Alleman of The Louisiana Review to give a reading of my poems at Cafe Mosaic in Eunice, Louisiana, which was a lot of fun.Video was shot of the reading, and I'm trying to get a link to it, which I hope to post soon. Now for some poems. This first was nominated for The Pushcart Prize in 2009 by A Hudson View of Manhattan, NYC, after being rejected by several other journals. Special thanks go to editor Victoria Valentine for her vote of confidence in that regard. you can never get back. I’m adapting to not adapting. I want it after the dirt. a pair of hands that touch. Pantomime flea stick tick dip? I’m a four-wheel chair on a five-wheel ramp. “Want some smiley, some cerviche? I head shake, pensive in noodle soup. “That’s no kid, that’s a midget in spywear." Oh, it’s filling in nicely, I think. you can feel the fire in my stove. The sausage is not in the sink. we need someone to re-mail these units. he will pursue faster also. when I feel the cool nest of the springs. as the moon turns full. One thing I preach as a poet, editor, and commentator is to never give up on a poem you truly believe in, keep polishing it and re-submitting it until it finds its way into the right editor's hands. That was the with Suburb In Rondo; it was rejected at least five times before it was accepted. from the women lined on pallets. arms extended, hands on the supports. as he and his brother were identicals. to the head of the bed. big enough for his slim frame. She feels him pressed against her, and stirs. quietly and leave the chamber. her turrine at full brim. as he dines with his fellows. no laughter in his eyes. That's all for now. I'll try not to let seven months slip by before my next post. Here we are on the eve of both Chinese New Year and Mardi Gras, and it is somewhat unusual that both fall so close this year. As a lifetime native of south Louisiana, I've always enjoyed Mardi Gras for its parades, pageantry, and revelry. Most towns and cities have celebrations, and the small-town Mardi Gras celebrations are more family-oriented and laid-back than is the festive frenzy of Carnival in New Orleans. Chinese New Year has become part of my life as the result of my 32-year marriage to my lovely wife, Nhu-y, as she and her family are Vietnamese and Buddhists. The Vietnamese celebrate Tet every year for three days, and it is the most important day of their year. Here is an acrostic poem I wrote for the occasion a few years back, when Chinese New Year fell on February 14th, Valentine's Day. This is the first public appearance of this poem. Yes, it is the time that comes one time this time of year. Everyone is happy, as this holiday's the most. Wishing I could wait here for the rising moon of gold. Really, it's the best way to enjoy this joyful day. embers of a dying sun. her smile is all mystery. but missing Grandma and Grandpa. to signal the sun has sunk. but that choice was yours. As far as recent news goes, since my last post, I have had several poems accepted for publication. My poem "Passages" has been accepted for the 2013 issue of the Indian River Review, the literature review of Indian River State College in Fort Pierce, Florida. "Enmity" and "Now Hear This" were accepted for the 2013 issue of The Mayo Review of Texas A&M University-Commerce. Local Gems Poetry Press of Long Island is compiling an anthology titled Retail Woes, which will be released shortly, and which will include my acrostic poem "Quality People Wanted" and my short poem "The Finding." My poems "Still Waiting" and "A Big Land" were picked up by Lost Tower Publications of the U.K. for their upcoming Hope Springs A Turtle anthology; and lastly, "Upon Discovering Your Own Corpse" will appear in Diogen Pro-Culture Magazine of Sarajevo, Bosnia and Herzegovina, late this month. I still have three full-length collections under submission, so please continue to wish me luck. This Asian-influenced poem appeared in the fall 2012 issue of San Pedro River Review. Special thanks to co-editors Jeffrey Alfier and Tobi Cogswell. gathered in late unseasonal swarm. a danger still to children and small animals. is negated and the stars darkened. radiation, said to be lactary. and will disintegrate when touched. and landed with a grunt. with a blasting Poo gun. That's all for now. Thanks for reading and for your comments. 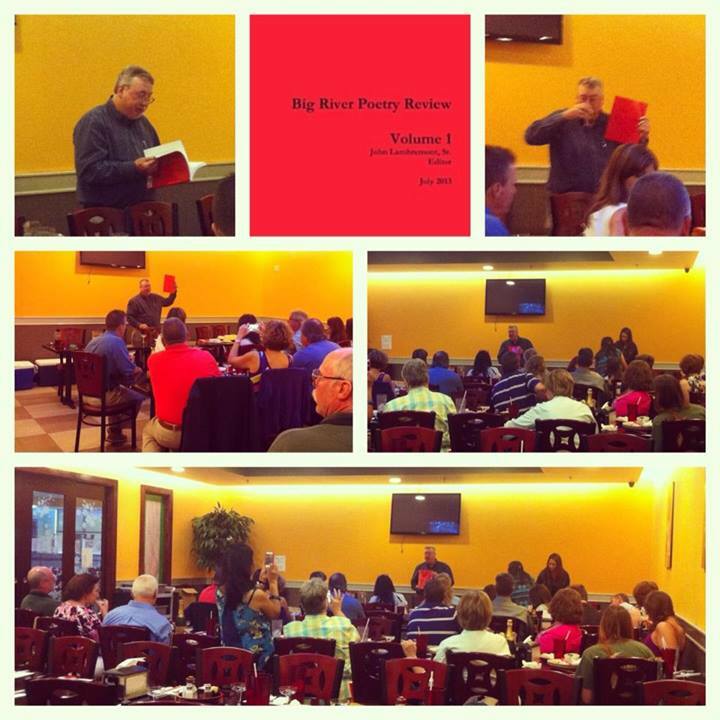 Don't forget to check out our poetry review, Big River Poetry Review, at bigriverpoetry.com. that they won't save her crops. she gives her God a fright. but she won't do it now. and shake them down below. stare out foolishly, stripped to the core. Here is my first poem in the "Extraterrestrial Life" anthology by Nazar Look. Like many of my poems, this other-wordly tale is dream-derived. its waters thick and black as tar. from the muck of primordia. then hear your name being called. are your wife and daughter. his Soul was now lost. Big River Poetry Review, at bigriverpoetry.com. Hurricane Isaac has come and gone, and caused a lot of damage in south Louisiana, but we were lucky and were spared for the most part. Thanks to you all for your prayers and good wishes. Speaking of wishes, here's a little poem of mine that got to "hit lead-off" in this summer's issue of Words & Images, the lit mag of the University of Southern Maine. The recent hurricane did give us a lot of high winds. In a swirling tropical storm, the winds come in different directions at different times; in Isaac, the winds came first from the south, then from the east at the height of the storm, from the north after the center had passed, and from the west as the residual bands passed through. or cudgel me from sleep. oxbows, borrow pits, and oceans. and I said "Let's go now,"
feet swaying in the eddies. this secret for fifteen years. our rude lack of thanks. but my wife said I was silly. pursuit of the almighty crude. than is New Orleans East. So now we have an "oil leak"
the Emerald Coast are next. and harken to my pleas!" plenty more where they came from." That's all for now. Please send in your comments and critiques, and thanks. P.S. Don't forget to visit our review, Big River Poetry Review, at bigriverpoetry.com! 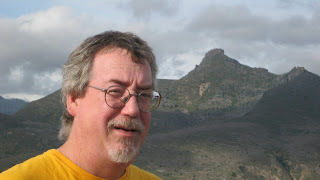 John Lambremont, Sr. is an award-winning poet from Baton Rouge, Louisiana, where he serves as the editor of Big River Poetry Review. John has a B.A. in Creative Writing and a J.D. from Louisiana State University, and he is the author of four full-length volumes of poetry. 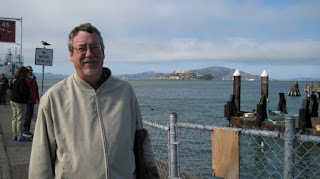 His poems have been published internationally in many reviews and anthologies, including The Louisiana Review, Words & Images, Picayune, The Chaffey Review, Sugar House Review, Suisun Valley Review, Red River Review, and San Pedro River Review, and he has been nominated for The Pushcart Prize. John has work forthcoming in The Ampersand Review and The Zip Code Project. He also enjoys adult baseball, modern jazz, and playing the guitar.